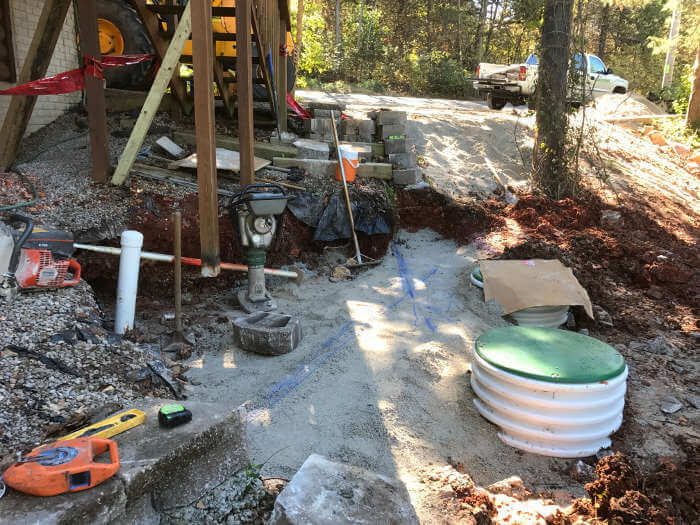 This project consisted of us replacing an old metal septic tank at Table Rock Lake with a new poly septic tank that meets the Missouri state and Stone County regulations. Click on the images below to see a step by step process of this project. 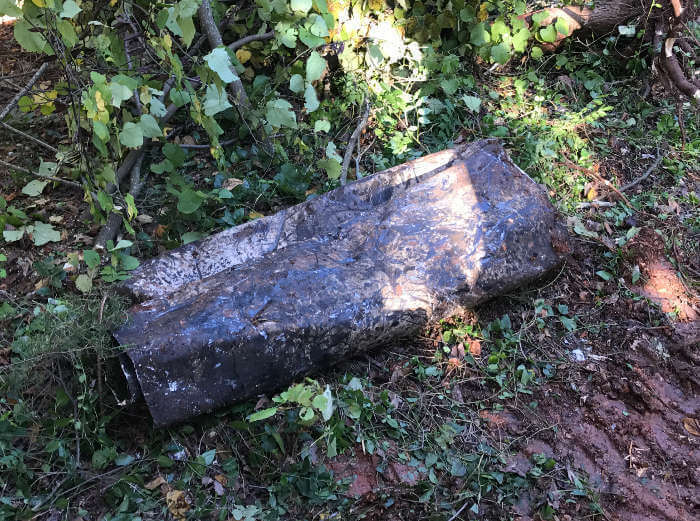 Locating old metal tank before image. Upon initial excavation, we found a rusted out hole in the top of the tank. 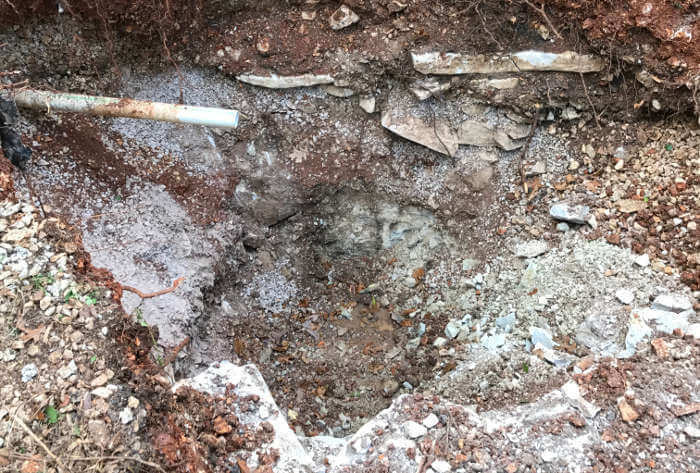 Additional excavating revealed that the tank was caved in and the inlet pipe was crushed. 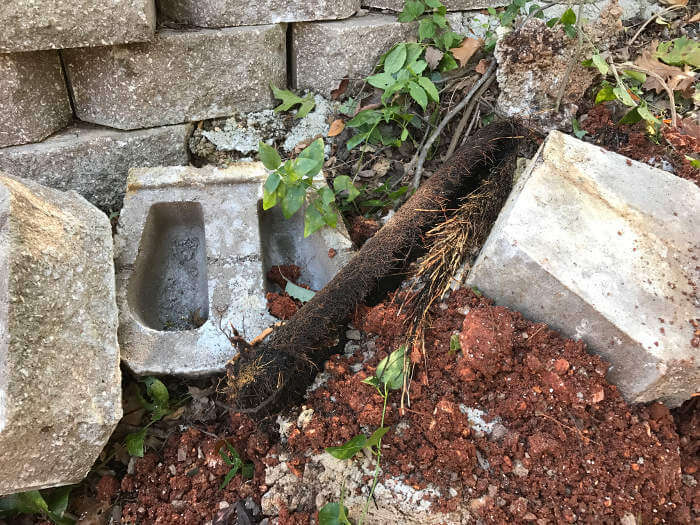 A closeup shot of the damaged outlet pipe reveals a large root wad headed toward the dispersal line. We pumped the septic tank prior to removal. Sewage disposal truck hauling away waste. 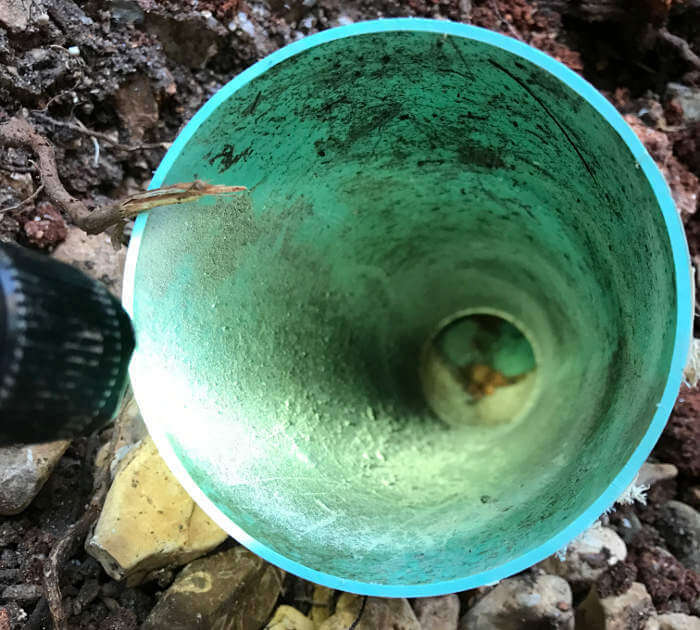 Tank inlet pipe has been exposed and cut to avoid disturbing inlet pipe during tank removal. 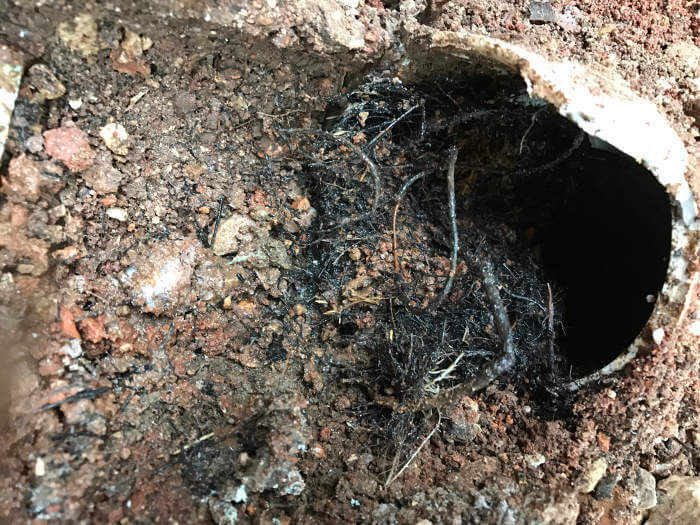 Root wad removed from pipe between tank outlet and dispersal line. Inspecting pipe leading to dispersal line after root wad removal. Line that root wad was removed from is capped to keep dirt out during tank removal. 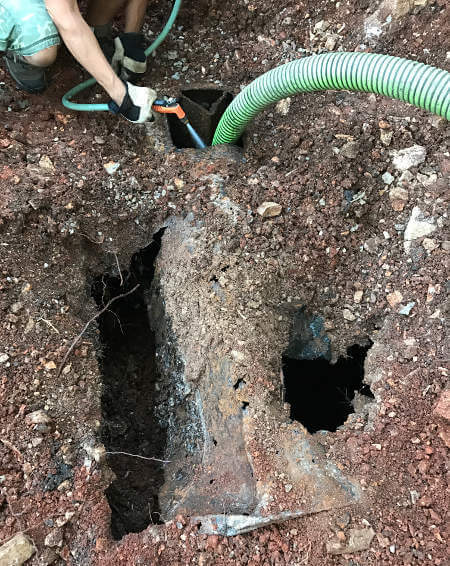 Removing metal septic tank with backhoe. Demolishing old tank after removal. Compacted old tank for easy disposal. 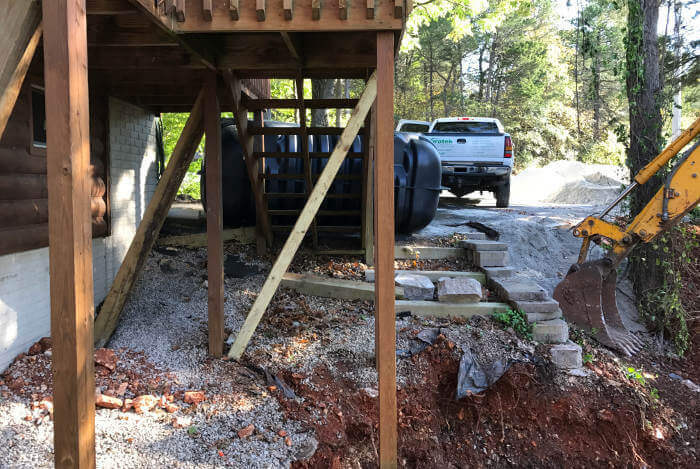 We installed temporary supports for deck and stairway during tank excavation. We encountered solid rock after removing old tank. 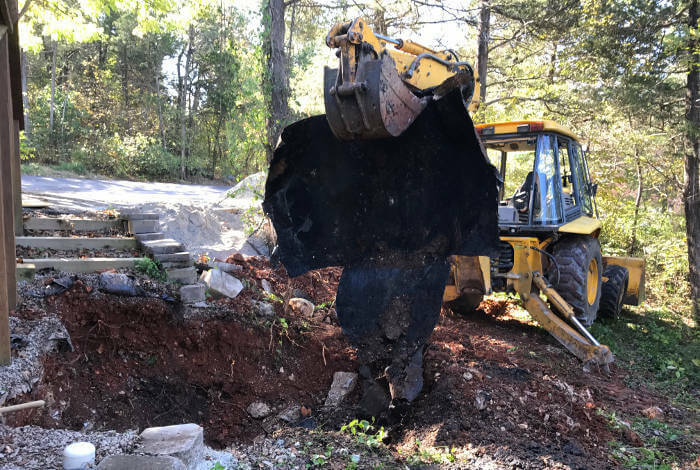 Rock breaking with backhoe to allow access of new tank installation. Installing a new Envirotek Systems E1000GF poly tank. 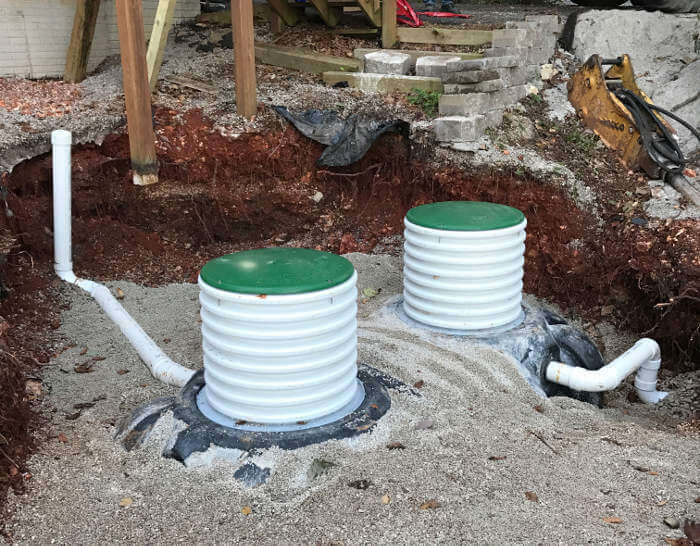 Installed our Envirotek Systems model 2424 riser/lid assemblies after select gravel back fill and compaction for easy future tank maintenance. We compacted gravel around tank and lines. We reinforced deck supports after back filling. 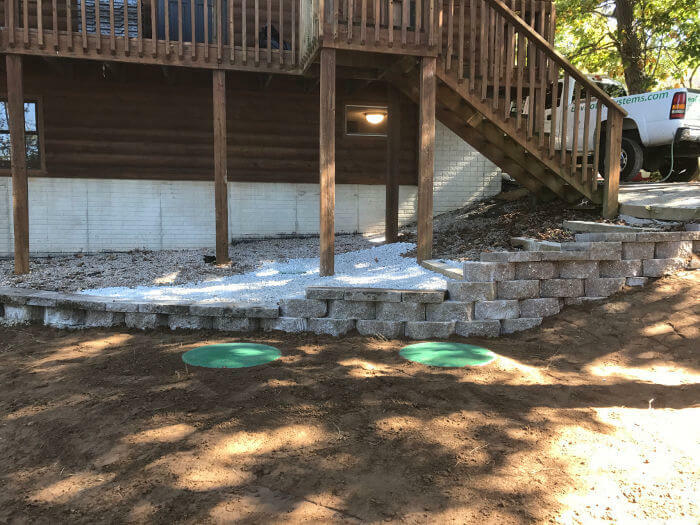 Deck, stairway and retaining wall restored. New Envirotek Systems tank and riser assemblies to grade, complete with topsoil and finish grading. 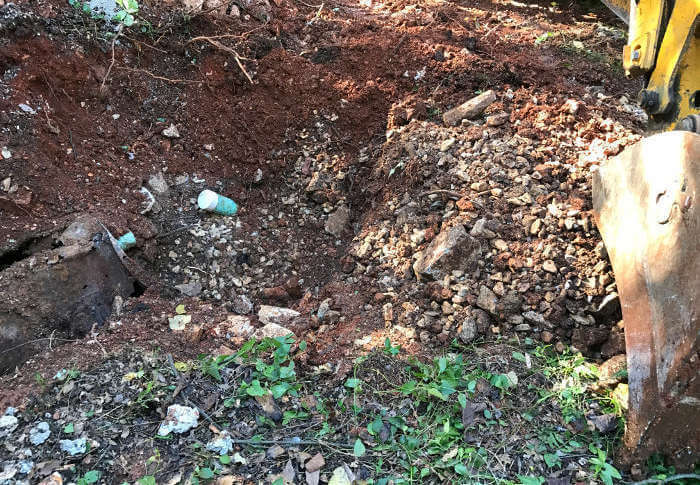 The location of the septic tank inlet has been electronically located and the hole is directly above tank inlet. 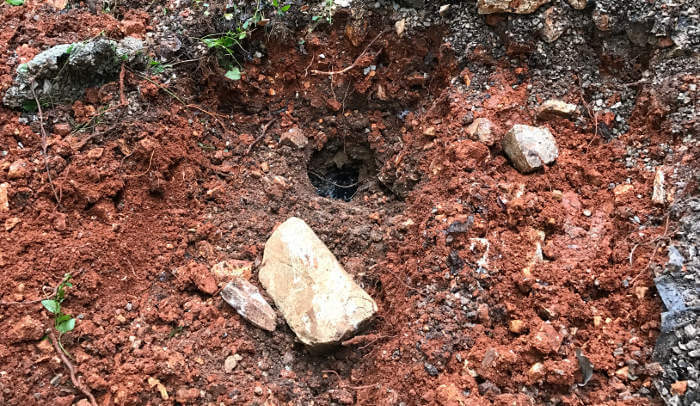 A hole appears revealing a rusted out metal septic tank after beginning the initial excavation. 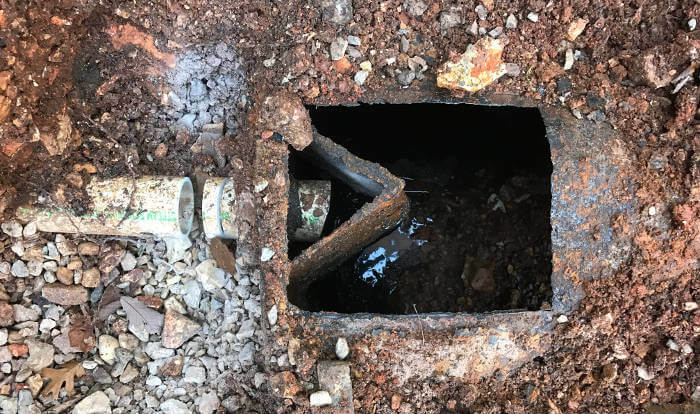 After additional excavation more of the failed metal tank is revealed as well as a damaged outlet pipe connected to the dispersal line. Tank being cleaned and pumped before further excavation. Pump truck preparing to haul sludge to state approved disposal site. Metal tank demolished and folded. We added temporary supports for deck and stairway during tank excavation. 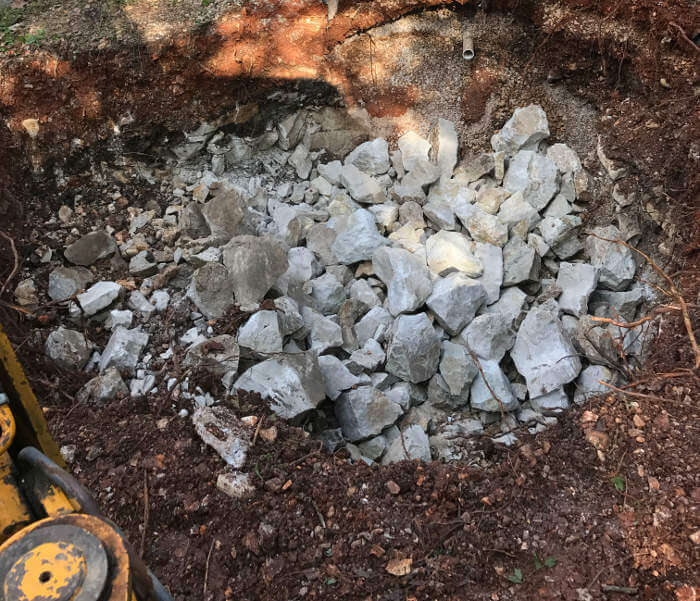 Solid rock encountered after metal tank removal at beginning of excavation for new Envirotek Systems E1000GF poly tank. Initial rock breaking has begun. Poly tank set on gravel bedding after rock removal is complete. 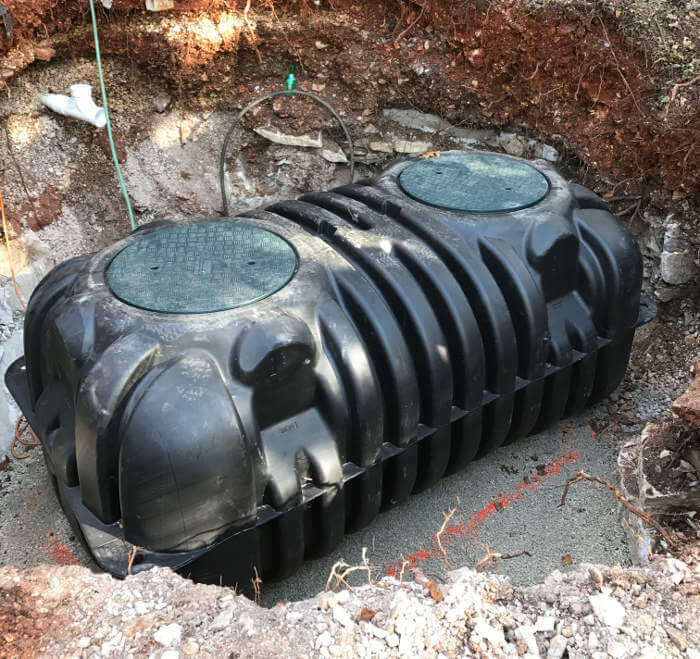 Envirotek Systems E1000GF Poly tank complete with Envirotek Systems model 2424 riser/lid assemblies after select gravel back fill and compaction. Inlet piping with double clean-out on left. Outlet piping to dispersal field on right. 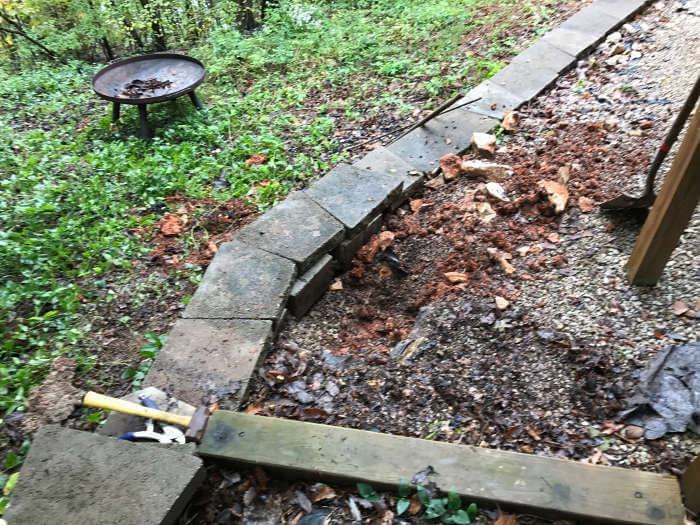 Base rock compacted and prepped for retaining wall reconstruction. Deck and stairway post re-supported. This project had a variety of site conditions which raised the degree of difficulty. The site is a lakefront lot built on a bluff that overlooks Table Rock Lake. 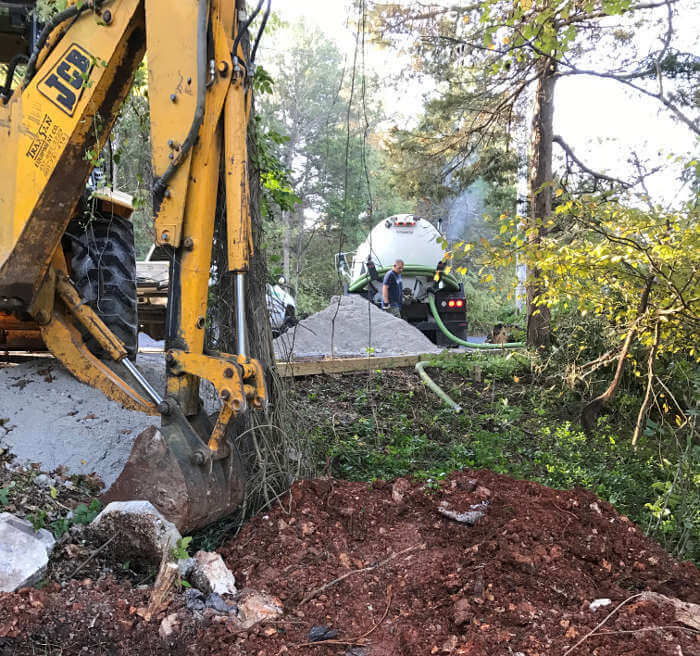 The only access was from an eroded driveway edge which was addressed before accessing the tank location. A very steep equipment access ramp was built with spoils from the tank area. 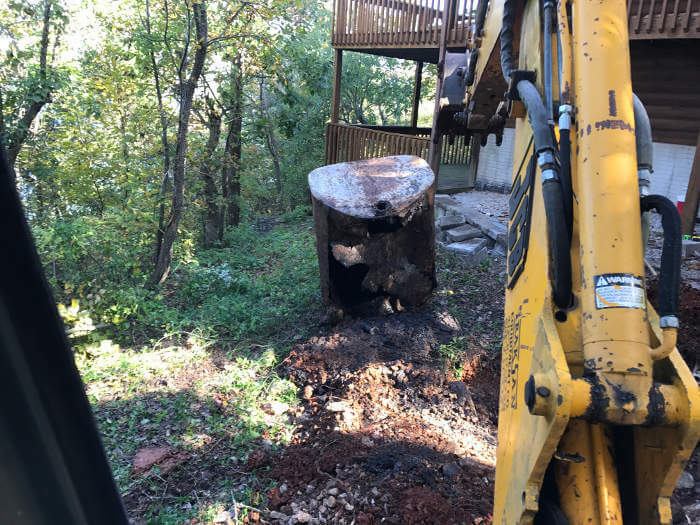 Additionally, the tank was located underneath an existing retaining wall, stairway and deck support posts. 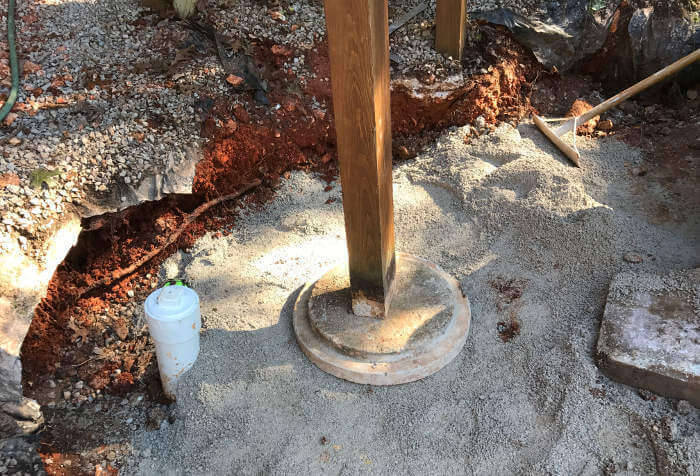 Temporary support braces were installed to protect the integrity of the existing deck, stairway and house foundation during the tank removal and installation process. A very narrow equipment access was constructed while protecting the original natural landscape. 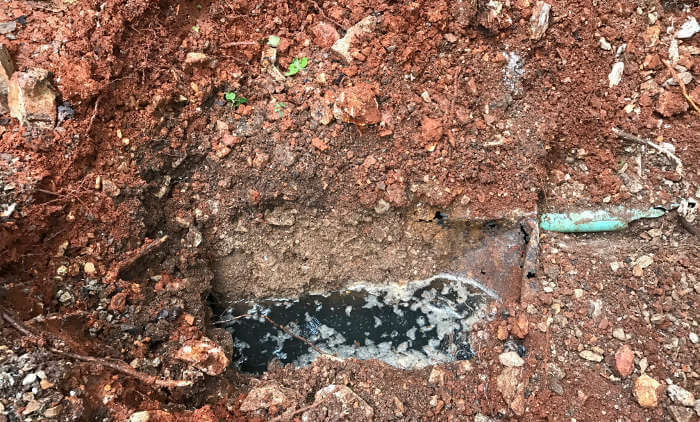 Whether you need a metal septic tank replaced or repaired, you can expect professional service backed by quality workmanship!